Ultra Music Festival is coming to Croatia from 12th – 14th July 2013 for Ultra Europe. Taking place in the city of Split (12th& 13th July) and the island of Hvar (14th July) for the very first time, organizers have also revealed the further news that Ultra Europe will now be housed exclusively in Croatia for at least the next five years. With over 60,000 attendees expected to descend upon Croatia for the debut edition of the annual event next summer, Ultra Europe will take place at the Poljud Stadium in Split for days one and two, while the third and final day will see the event hop to the Hotel Amfora Grand Beach Resort on the stunning island of HVAR – just a short ferry journey away. Performances from all three days will be streamed globally through UMF TV and UMF Radio. Ultra Europe will also be one of the first major events of its kind in Croatia following the country’s expected entrance into the festival will inject more than $20 million (over 150 million Kuna) into Croatia’s economy over the next five years, and is considered to be one of the most important investments in the Croatian tourism and entertainment industry in recent times. 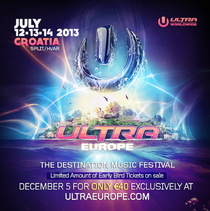 For more info, check: www.ultraeurope.com. Russell Faibisch – Founder, Executive Producer and CEO of Ultra Music Festival and Ultra Worldwide said: “Electronic music is one of the most popular and fastest growing genres in the world, and the Ultra Music Festival has been recognized as one of the leading festivals of that genre. Taking into consideration the highly developed music scene in Croatia and the excellent reputation of Split and Hvar as top tourist destinations, the decision to bring Ultra Music Festival and the incredible experience it has to offer to Croatia – in the form of Ultra Europe – was an easy one to make. We strongly believe that electronic music fans are acutely aware of what Ultra Music Festival represents and will come in great numbers to share this amazing experience in both Split and Hvar this July”.